This is an online first feature. In 2001, Argentina experienced the largest sovereign debt crisis in history. As a result people’s bank accounts were frozen and workplaces were closed and asset-stripped – most Argentinians lost everything. However, the response didn’t take long to come: bartering systems emerged that involved somewhere between 3 to 8 million people and workplaces were recuperated by formers workers who transformed them into co-operatives. 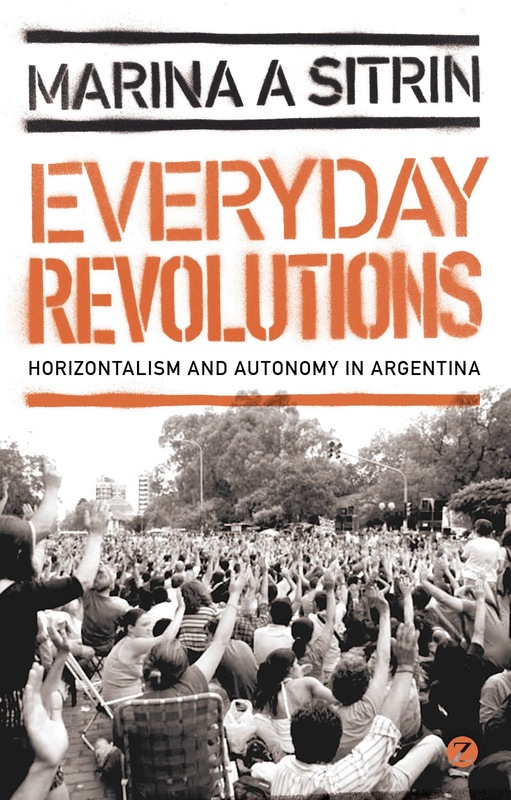 In her new book Everyday Revolutions: Horizontalism and Autonomy in Argentina Marina Stirin retells her experiences of neighbourhood assemblies, the rise of the recuperated workplaces, and how horizontal decision making has become the popular form of organising responses to neoliberalism. Jonny Gordon-Farleigh: Your new book Everyday Revolutions: Horizontalism and Autonomy in Argentinatraces Argentina’s recent history from its sovereign debt crisis in 2001 through the bartering systems that emerged and the workplaces that were recuperated. The public’s demand, “They all must go!”, expressed a radical shift from parliamentary politics towards participatory democracy. The financial crisis in 2001 obviously wasn’t the first crisis in Argentina’s history. What could begin to explain the different response? Marina Sitrin: There are a number of things that can help explain the difference in response. One is the depth of the crisis: While there had been crises in the past, this was a growing crisis where privatization had reached a tipping point. In addition to this was the moment of the Cacerolazo, where protestors banged pots and pans. The government also froze people’s bank accounts and this was the spark when people began to realize how deep the crisis was. The government feared that there would be a run on the banks, like in 1930s America, and people would withdraw all of their money and devalue the currency. That is on the issue of economics, though, and I guess you are asking why the new political form emerged in that moment? I think this is a really important question and we can begin by placing Argentina in the context of social movements that started in the mid-90s, particularly with the Zapatistas. We’ve also seen many forms of autonomous organisations form all around the world, but especially in Latin America. Then as we move towards the end of the ’90s, a big part of the conversation was the rise of social justice movements such as the anti-IMF. I think Argentina is part of this global experience rejecting institutions of global finance and, in turn, rejecting the course of action that looks to them to solve our problems, and even not wanting them to even if it was possible. I think this is where the shift in Argentina comes from in a global context, but in terms of Argentina itself, in the book I talk about the group HIJOS – the children of the disappeared – who started organizing in the ’90s. You can see the roots and forms of horizontal organization, direct democracy and direct action in their work, as would also be seen after 2001 in groups like the unemployed. History is a very tricky subject because one could go on and on about all the different connections that are probably true and, at the same time, none of them have to be necessarily or absolutely true. In Argentina you could look back to the late 1800s and early 1900s and find there was the largest Anarchist-Syndicalist movement in the Americas, at least, and in terms of publications probably the most in the world during this period. At the time workers were taking over parts of the South of Argentina, running workplaces and running towns. This is a part of the history, but at the same time we have to ask does that have a direct connection with what happened in 2001, and also question why it didn’t happen earlier. I don’t know. I think history can have an influence on our imagination instead of the idea that something happened at some point in history and we are now attempting to replicate it. There are a lot of examples like this in Argentina, and there is also, if you look at the political forms that emerged after 2001, a rejection of a lot of political forms that is consistent with what’s been taking place in Latin America, and now with Occupy and the movements in Greece and Spain. These movements are essentially rejecting the political party formation, hierarchical forms of organising and looking to institutions of power to answer people’s problems or demands. Rather, people are coming up with their own alternatives together and this is a big rejection of party politics and the guerilla struggles of the ’60s and ’70s. When a philosopher turned up to speak to the students in ’68 they said, “Sartre, be brief”. It seems that those in Argentina would not even have the patience to say, “be brief”. Apart from being an obvious justification for writing the book, why do you think they should be so worried by the industry of commentary? MS: Well, I think it is important to engage with some of the high-profile public intellectuals and academics, especially when there is so much disagreement with them. The reason for this, unfortunately, is because it is their voices that predominate. So if it’s an academic voice that is heard speaking about the movements and they are saying the movements are dead and have no horizontal processes, I think this does a huge disservice to the movements whose voices don’t get shared in the world. I think it’s also important in terms of the historical record, but also because there is increasing repression of autonomous movements around the world. When it comes to mobilizing support and defence on behalf of the movements it is important to have as many allies as possible. So, some of it is just strategic and the other part is the historical record. Now, I don’t think anyone should spend too much time engaging with them but I cannot tell you the number of times I do presentations, one just a few weeks ago, and someone with authority said, “I’m an academic whose spent time in Argentina studying the recuperated workplaces and they are completely consumed by the government and they’ve been shrinking over the years in number”. That is completely false and I’m not even sure where he got his information. I then had to politely tell him it was completely false and give him citations of how he could find out the real information. Spreading that misinformation, though, doesn’t help anyone, and it also doesn’t help those in Thessaloniki, Greece where there is a recuperated factory now. Those in the movements had been mobilizing and were shown the film The Take, as well as the oral history book I had done on the first few years of the movements in Argentina, which had been translated in Greek. So they had been really engaged with the idea of recuperated workplaces and it succeeded in one place called ?? in August. Then, in September someone from the recuperated workplace movement from Argentina came to Greece to help share their experiences. Had the workers in Greece believed this experience had only happened for a few years and then completely failed, they may not have tried it. The disturbance that misinformation can do is huge. JGF: In your conversations with those involved in recuperated workplaces and neighbourhood assemblies, many fiercely resisted being called “political” and would refer to themselves as “protagonists”. While it’s a critique of the “revolutionary party” — say in its Russian or Chinese incarnation — it is also of the exclusion of people that occurs in every single form of representative governance. Do you think what is happening in Argentina is part of a global movement towards self-governance? MS: Absolutely, and I think the recuperated workplace movement is one of the best examples of this impulse and desire, I’m hesitant to say instinct, for self-organisation that comes from a combination of necessity and reaction to what came before. Interestingly, though, it is not coming from an ideological place, which, I think, makes this historical moment (say through the mid-90s to today) different. People are no longer only rejecting institutional power and the state and creating horizontal forms but are doing it through self-organisation, and not because some book said this is how you make a more free society. Instead it has come through the process of organising out of a real crisis and necessity in places like Argentina and Greece but also in other places where the crisis hasn’t hit as deeply. This form of organising, self-organising, is about asking to be left alone to do it and it is going on everywhere. What is most inspiring to me is in places like the recuperated workplaces where they say, ‘We’re not political’, and in the US in the anti-foreclosure movement, based in the neighbourhoods, where a lot of times it’s just neighbours who get together and say, ‘Who is expecting to be foreclosed? Let’s have a BBQ in someone’s backyard and talk about how we are going to defend the houses’. These people are not going to protest outside of the banks, or at least not at the beginning. The first thing they do is make sure people stay in their homes and support each other. This, I think, is a growing phenomenon. JGF: This resonates with the Transition Network — a decentralized group of people responding, primarily, to the environmental crises around climate change and peak oil. Whilst it started from a certain scientific approach, which is undoubtedly important, one of the co-founders said that he was surprised that that the biggest shift had been a cultural change. Through neighbourhood organisations — known as ‘Transition Streets’ — people started to associate with each other again and used this collective activity to approach these environmental problems in turn. It seems that things start to happen when we start associating on a local level and not only in response to scientific facts or political statements. MS: I think this subjective change, which is also a material change, is so much more powerful. Keeping your neighbours in their home, stopping people from getting evicted, or running a factory together in a co-operative way changes social relations. I don’t want to say it empowers, because empowered is a word from the old forms of organising, but people say they feel happier and they feel power with each other. The rejection of the ‘political’ isn’t just a rejection of political parties but also of a certain way of doing politics. It is more about social relationships where we can discuss how to stop an eviction at a neighbourhood BBQ, and this has a different kind of sentiment. At Zanon, now called FaSinPat (‘Factory without Bosses’) in the South of Argentina, so much of the organising before they took over the factory was at football games where they were building relationships with one another on a very human level. JGF: One challenge to self-governance and non-state organisations is the arrival of someone who is perceived as a better political leader. The election of Obama had the effect of reinvesting hope in mainstream politics — if only for a short while — and the election of Kirchner had the same effect in Argentina. You talk about the divisions caused by Kirchner’s election in relation to the Madres de la Plaza Mayo. Don’t you think there is a difference between the organisations that have formed since 2001 and their relationship to the state, when compared to the Madres de la Plaza Mayo who formed in opposition to a particular regime (in this case the Dictatorship of Jorge Rafael Videla)? MS: The response from the more autonomous movements has been quite mixed. They’ve managed to maintain a form of self-organisation and autonomy and I would also include the recuperated workplaces and unemployed in this. It got very complicated when the Kirchner government came into power and not only because the government was offering people material things that they needed but because of some political changes. It is important to understand the history of the dictatorship in Argentina during which more than 30,000 people disappeared and all the governments up until Kirchner passed a law saying let’s all forgive and forget. You have to remember that at this time there were still thousands and thousands of people who were involved in the military and acts of torture during the dictatorship still living freely in society, and this is how Argentine society was supposed to move forward. So, when the Kirchner government started prosecuting and doing some very important symbolic acts early on, it resonated with everyone. This didn’t mean that people had an orientation towards the state but found it was really difficult, as a movement, to be against the state when the state is taking a really important course of action whilst also acknowledging the fact that only the state is in the position to prosecute thousands of people in this particular historical moment. This gained some popularity for the government and made things a little bit confusing. Then there was the question of material support and the government, responding to ‘They all must go!’, offered material support to restore some sort of legitimacy to the state. They also went after campaigners and leaders to come out as supporters and even take positions in government — it was a very disorientating time. All of that said, there were movements, it is important to say, who said we will have absolutely no contact or engagement with the state. Theoretically this is a good position but practically it’s not because sometimes the state wants to have a relationship with you and you can’t control it — in the example of repression. However, this was also a reflection that the movements were beginning to have themselves, and beginning in 2009, members of the unemployed decided to have some contact with the state. Not in the sense in which this is where change happens but more orientated towards the Old Left’s argument, which I think is a truism, which argues that since the wealth of the state is ours, how do we get some of that back without getting caught up in the state’s agenda? So that is one of the most important lessons and one of the most interesting things that is happening in Argentina now: how movements are continuing to self-organise, continuing to maintain autonomy but yet finding ways to get certain resources from the state they might need but only on their own terms – it’s complicated! It’s easier for the recuperated workplaces to do this but, then again, they also have a very broad network that if the state withdrew its support they could borrow from each other or barter. It is more difficult for the unemployed movements. However, what they’ve been doing to maintain their agenda, whilst also receiving from the state, is to first start building homes, for example, and then rather than make a demand on the state to come and build the houses, they will instead ask for a list of materials. It is still an ‘in progress’ moment but I think it is so important for us in the movements, when we are struggling for self-organisation and autonomy, that we find ways of getting our wealth back from the state. JGF: In the UK we are at a completely different starting point — a heavily centralized society that is used to the state meeting our needs (remembering that the state is just an abstract way of us collectively meeting our own and others’ needs). Other countries that are not used to the state’s involvement in education and healthcare provision already have alternative infrastructures to meet those needs. So, it’s a different challenge for every community. MS: It’s true. For the UK and parts of Scandinavia it is a much more difficult question. In the US, or Latin America and other parts of the world, people don’t expect the state to meet their needs anyway. It is much easier to move away from the state when it is not your point of reference because we were never their point of reference. JGF: Most of the book explores the emergence and practice of horizontal decision-making in Argentine society. The neighbourhood assemblies that used this method could number in the hundreds and the general assemblies in the thousands. It’s not a process without its problems — sometimes down to the inexperience or intentions of its participants. What examples did you see of improvements and innovations to the process, and in what ways did its users creatively contain disruptive and unfriendly forces whilst retaining their values of democratic inclusion? MS: It’s a great question having seen it in Occupy so much and all over the world. There were a number of things that Argentines did and do in assemblies that I think are really useful in making a more democratic space. In Argentina they started with a very loose structure and then began to have a little more structure. Whereas in the in the US we were overly concerned with structure and forgot to be human beings — it was more about the rules than the actual dynamics and ideas for why you have certain structures. So the Argentines moved in the opposite direction from being really flexible to having certain structures. Flexible spaces are really important in assemblies, and when someone was excessively talking it was dealt with, over time, through social pressure instead of enforcing a rule. It wasn’t the facilitator saying, ‘You must be quiet!’, but the group as a whole. Over time, this idea that we have to be really polite with each other, not disrespect the person and always look to the authority of the facilitator actually shifted to become a lot more horizontal. People would do everything from turning their backs on the speaker — one of my favourite stories — because the facilitator would say, ‘You’ve taken up to much time and other people must be given the time to speak, please stop’, but they would continue. So other members of the assemblies would turn their backs and have other conversations and then speaker would stop because no one was listening to them. Instead of seeing this as some moral rejection it would take seriously the fact that if we only have two hours and one person is taking 15-20 minutes then they are taking the time of lots of other people. Objecting out loud was also a successful strategy especially with old left political parties who were really disruptive in the neighbourhood assemblies. In the beginning, the old leftists considered the recuperated workplaces a form of petty bourgeois owners. JGF: Self-exploitation was another charge. In Greece, similarly, this is one of the lessons they learned when they were in the neighbourhoods, after Syntagma Square, and someone would get up to speak and say, ‘I’m Kostos’, and people would yell, ‘No you’re not, you’re Kostos from the Communist Party’. It’s not that the person cannot speak but it’s making it really clear who they are and from what position they are speaking. JGF: It’s interesting to hear you talk about the level of self-regulation in these groups. A problem that occurs within groups that organise at a distance from the state is that they are subject to certain abuses and exploitations — theft and sexual assault, for example — and it becomes a really important question of how to deal with them without resorting to the state or police. You refer to this in the book and give examples of different experiences. Could you talk about them and how successful they were? MS: Yes, self-regulation or alternative adjudication. I saw this happen in quite a few different spaces. The spaces where this occurred were largely geographical and territorial: where collectives owned a building, where the unemployed were on a strip of land, or in a workplace. I’m not sure this means it can’t work in other places but I only saw it work in those places where there was a geographic boundary. There were many conversations that were really new for the movement and people would come to the assemblies and retell how something happened to them like sexual violence or a robbery. We would then have to figure out how to adjudicate the matter and there wasn’t a written rule how to do it, but there was commitment by the group to try and solve conflicts together. In one instance it looked very much like the things I’d read in Circle Justice coming from indigenous traditions in the northern parts of the Americas and now Canada. One young woman who had been assaulted came to the assembly with allies who supported her and the young man (who was accused) with his friends. Then we had a discussion to decide what to do about it. In this case, it wasn’t even clear to the young man that what he did was sexual violence — women’s oppression is often that deep where it comes to the point that when a women says no, that’s what she’s suppose to say. This is basically the direction this discussion went and it was partly about educating the young man and his friends, who were of a similar opinion, and then figuring out what would work for the two individuals but also the assembly. It was decided he needed help but also that he could not return to that space until he had received help from social workers. There are many examples of where alternative adjudication worked successfully but I would also like give a note of caution: It takes a lot of time for movements to achieve this, and we have to, but I would also advocate for having some formal structures for how some of it can work. This is because it takes a long time, not only the minutes you participate in the assembly, but also the emotional time. What is most beautiful about the movements is the new social relationships based on trust, love and affect. If we are building these relationships and then there is a violation from someone within the group, especially a core participant and not just a young kid who comes to a party, it can be extremely disorientating and upsetting. So mechanisms that can deal with these problems in advance are really important. Also, I think what’s beautiful about these new relationships is also leaves us vulnerable to political police, harassment and worse because, if (hypothetically) someone who is a leader violates this trust (and is paid by the police), it can cause so much disruption within a movement. This is somewhere where our relationships make us strong and vulnerable simultaneously. JGF: Finally, the crisis took place in 2001 and the Argentinean public didn’t take its time to respond. What is happening now just over a decade later and it is cause for hope? MS: Absolutely! There are more recuperated workplaces and there has been a huge increase since 2009 (there are probably about 350 now). To be clear, a recuperated workplace is not just the workers and their workplace but also the community. There are many layers of support and participation in the workplace and it becomes like a community centre where it is used for popular education, alternative high school programmes, and all kinds of things happen. You don’t have the neighbourhood assemblies on the same scale but a lot of the organizers are now teachers in alternative high school programmes. The unemployed movements, the more autonomous ones, are organising on the basis of maintaining their agenda and are struggling with that — even though it is cause for optimism. Then, there is the international mining company that is trying to blow apart the mountains all across Argentina and in every town and village people are organising in assemblies, using horizontal decision-making. They don’t physically allow the exploitation of the land — this is women and their bodies keeping the military and dogs at the bay. At the same time, this is not only protest against because they are using assemblies to self-organise. So there is definitely reason for hope. One last thing: As people come together to organise, the vast majority start from the assumption that it will be horizontal. There is no political party program, still no orientation towards the state, and people talk about it like it’s a given. One of the things young people have been calling themselves, and I think it’s really beautiful, is HIJOS of the 19th and 20th. Even the children who were young at the time of the rupture in 2001 — the financial crisis and the response ‘They all must go!’ — are saying that it’s this new form of politics that informs them and I see that as incredibly inspiring. Marina Sitrin holds a PhD in Global Sociology and a JD in International Women’s Human Rights. Her work focuses on social movements and justice, specifically looking at new forms of social organization, such as autogestión, horizontalidad, prefigurative politics, and new affective social relationships. Her first book, Horizontalism: Voices of Popular Power in Argentina, is an oral history based on the then emergent autonomous movements in Argentina, published in Spanish (Chilavert 2005) and English (AK Press 2006). While much of her recent published work has been on contemporary social movements in Argentina, she has worked throughout the Americas, the Caribbean, and Japan. Her current research includes the global mass assembly movements, specifically in Greece, Spain, and Egypt. There are many examples of where alternative adjudication worked successfully but I would also like give a note of caution: It takes a lot of time for movements to achieve this, and we have to, but I would also advocate for having some formal structures for how some of it can work. Published online in December 2012.